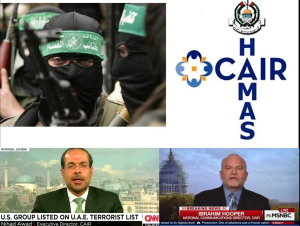 When individuals and groups capitulate to terrorists like those at the Hamas organization Council on American Islamic Relations – CAIR – they provide ammunition for the terrorists to create multi-use propaganda. Last week a Sheriff in Virginia and the President of a Christian University in Tennessee surrendered to the designated Foreign Terrorist Organization Hamas, doing business as CAIR, and gave them propaganda “victories.” So all readers are clear CAIR is Hamas, we refer you to last week’s UTT article entitled CAIR is Hamas . We encourage all of our readers to get a copy of our document detailing some of the evidence CAIR was the fourth organization created in 1994 by the U.S. Muslim Brotherhood’s Palestine Committee which is Hamas in the United States. The first three organization created by the USMB’s Palestine Committee were the Islamic Association for Palestine (IAP), the United Association for Studies and Research (UASR), and the Holy Land Foundation (HLF). All three were Hamas organizations shut-down/prosecuted by the U.S. government. The stated purpose/objective of the Muslim Brotherhood, per their By-Laws, is identical to the stated objective of the Islamic State and Al Qaeda. Our enemy in this war understands they cannot defeat us by destroying our tanks and our troops on the battlefield. They understand – and their strategic plans detail – the U.S. MB’s means to achieve their goals is to get our leaders to do their bidding for them. They call it Civilization Jihad by OUR hands. Their objective is to get leaders in the United States at the national, state, and local level to do their work for them. This includes police, media, pastors, university presidents, and others. UTT was directly affected last week by two examples of Civilization Jihad by our hands. The first example comes from Amherst, Virginia, where the Amherst County Sheriff’s Office refused to allow the county GOP to hold their event in the Sheriff’s Office – the usual site for county GOP meetings – because the featured speaker was UTT’s Vice President Chris Gaubatz. Local media from the News & Advance wrote an article on January 8th entitled, ‘Amherst County Sheriff’s Office nixes GOP plan to host anti-Muslim speaker at agency’. The article, like most articles referencing Hamas doing business as CAIR, fails to mention CAIR was founded as a front for the terrorist group. This is a fact, yet Mr. Moody never mentions one of the literally thousands of facts in evidence that CAIR is not only a Muslim Brotherhood organization, but was created to be a front for the terrorist group Hamas in the United States. 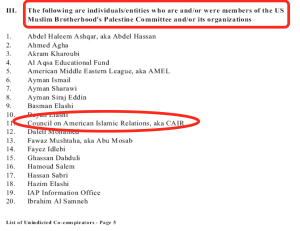 CAIR and its Chairman Emeritus Omar Ahmad are identified by the U.S. Government as being a part of the U.S. Muslim Brotherhood’s Palestine Committee in the US v HLFRD trial, Dallas, 2008 – the largest terrorism financing trial ever successfully prosecuted in American history. Hamas is a designated Foreign Terrorist Organization by the U.S. State department, and is the Palestinian branch of the Muslim Brotherhood. Despite all evidence to the contrary, Hamas/CAIR Communications Director Ibrahim Hooper is quoted in this article and taken at his word that CAIR is not an MB organization, but a civil rights organization. As UTT’s Chris Gaubatz has shared publicly, the first event he attended at Hamas/CAIR was a program on how to manipulate the media after a terrorist attack. Too many in the media get their talking points from Hamas/CAIR without ever doing due diligence. It is also disappointing an elected Sheriff would make a decision to cancel such an event based upon hearsay about the content of a program, especially when the hearsay comes from a terrorist group. A similar incident of Civilization Jihad by OUR hands took place at a “Christian” university in Tennessee last week. UTT’s President and Founder John Guandolo was scheduled to speak at the Trevecca Nazarene University in Nashville, Tennessee along with Cathy Hinners, and Bill Warner on January 25th at a Homeland Security Summit for Mae Beavers, a Tennessee state legislator running for Governor. Cathy Hinners is a retired police officer from New York who works teaching law enforcement professionals, including doing contract work for the U.S. Department of Homeland Security. Dr. Bill Warner holds a PhD in Physics & Applied Mathematics from North Carolina State University and was a research scientist and university professor. Dr. Warner is the founder of the Center for the Study of Political Islam which delivers the basics of Islamic doctrine in ways that are easily understandable to the average person. The Tennessean, a USA Today newspaper in Nashville, published an article about the program being canceled due to “concerns” the University had about the event. University President Dan Boone stands by the university’s decision to cancel the event. The first person reporter Natalie Allison quoted in the Tennessean article was Hamas/CAIR Communications Director Ibrahim Hooper. The article also quoted the disgraced and terrorist-supporting organization Southern Poverty Law Center (SPLC) which investigations reveal keeps millions of dollars in offshore accounts, and received over $50 million dollars in donations in 2015, yet only provided $61,000 in legal services. Same format: Terrorists (CAIR) complain. Media obliges them with a supportive story. Hosts cave in. Hamas/CAIR now has two more propaganda arrows in its quiver which it will regurgitate until the end of time or until the Department of Justice does its job, shuts CAIR down, prosecutes its leaders, seizes its property and money, and bulldozes its headquarters, which is two blocks from the U.S. Capitol. 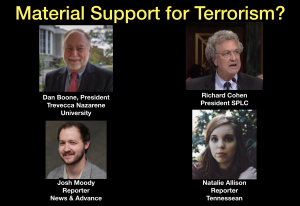 When does this continual media/SPLC/university president support for an easily identifiable terrorist organization become Material Support for Terrorism under Title 18 U.S. Federal Code Section 2339A?